Microbes live around us and within us, and our interactions with them are a matter of life and death, yet in regard to such issues as biodiversity, public awareness centers very heavily on “charismatic megafauna.” By making information about various microbes available and accessible, and by inviting imaginative response to that information, Microbestiary hopes to show, in welcoming and memorable ways, that the bustling microbial world is populated by strange and beautiful characters that are themselves quite charismatic: bacterial cells that contain coiled harpoons that unfurl to 15 times the cell’s own length when their ciliate host is attacked; ciliate protozoans with seven sexes and 21 different sexual orientations; ocean-going cells that glow in the dark; and so on. We hope that Microbestiary will offer insight, understanding, knowledge, surprise, and pleasure. Enjoy the site! Anon. 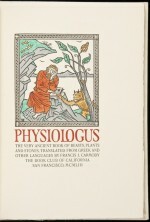 Physiologus. Trans. Francis J. Carmody. The Book Club of California, 1953. 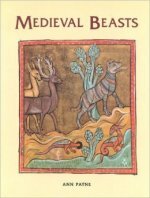 In this volume, Carmody has “reconstructed” the oldest bestiary, originally a gathering of “some fifty legends of animals, plants and stones” by a Christian monk in Egypt or Palestine, in each of which the monk found “a mystic meaning.” The book includes illustrations by Mallette Dean. Anon. 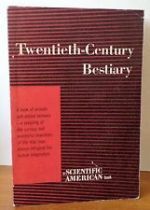 Twentieth-Century Bestiary. Simon and Schuster, 1955. Barber, Richard, translator. 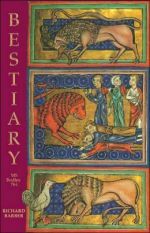 Bestiary: Being an English Version of the Bodleian Library, Oxford M.S. Bodley 764 with All the Original Miniatures Reproduced in Facsimile. The Boydell Press, 1999. In this edition, Richard Barber translates (from the original Latin) an illuminated medieval manuscript now held in Oxford’s Bodleian Library, and reproduces the images that accompany the text in the original. The beasts gathered here include real, ordinary animals (goat, cat, mule) and mythical, extraordinary ones (monoceros, basilisk). The book is more focused on consolidating Biblical and other narratives related to each beast than on consolidating scientific information about the beasts. Borges, Jorge Luis, with Margarita Guerrero. The Book of Imaginary Beings. Trans. Andrew Hurley. Penguin, 2006. 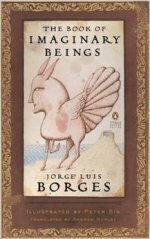 Borges and Guerrero describe themselves as having “compiled a volume of the strange creatures that man’s fantasy has engendered through time and space,” and emphasize its incompleteness, inviting readers to send them descriptions “of their own local monsters.” This particular edition is illustrated by Peter Sís. Henderson, Caspar. 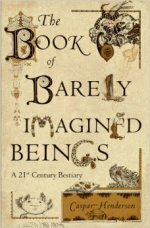 The Book of Barely Imagined Beings: A 21st Century Bestiary. Univ. of Chicago Press, 2013. Henderson, seeking to acknowledge that “for much of human history attempts to understand and define ourselves have been closely linked to how we see and represent other animals,” borrows traditional structures (such as alphabetical ordering of entries) from older bestiaries, but writes entries that incorporate up-to-date information about the various beasts (mostly creatures of the sea). McNamee, Gregory. 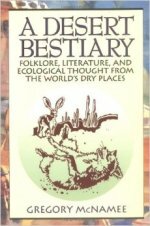 A Desert Bestiary: Folklore, Literature, and Ecological Thought from the World’s Dry Places. Johnson Books, 1996. As its subtitle indicates, this gathering of animals from deserts worldwide (the bighorn sheep, from North America, alongside the ostrich, from Africa) incorporates scientific information relevant to ecology, and also perspectives on the creatures from their depiction in folkloric and literary sources. Payne, Ann. Medieval Beasts. New Amsterdam Books, 1990. This book offers “a selection of stories, folklore and natural history taken from various [medieval] bestiaries,” compiled as those bestiaries themselves apparently were compiled, by selection and adaptation. Podwal, Mark. A Jewish Bestiary: A Book of Fabulous Creatures Drawn from Hebraic Legend and Lore. The Jewish Publications Society of America, 1984. 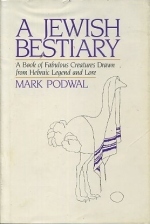 Taking advantage of the double entendre of “fabulous,” its capacity to describe surprising but real things or intriguing but unreal things, Podwal gives short characterizations of various beasts referred to in Hebrew scriptures, the real creatures (the ant, the raven), the mythical ones (leviathan), and the ones in between (the serpent). Robinson, Alan James and Laurie Block. An Odd Bestiary. Univ. of Illinois Press, 1986. 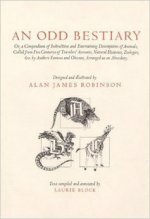 Robinson (who designed and illustrated the book) and Block (who compiled and annotated the text) take the methodology of the traditional bestiary (gathering, arranging, and illuminating material from other sources) and extend it to include sources more recent than medieval times (e.g. Charles Darwin and Sir Thomas Browne). Schaefer, Jack. An American Bestiary. Houghton Mifflin, 1975. 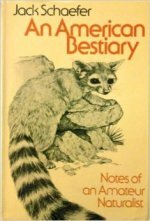 Schaefer presents only a very small selection of animals, each native to North America, but with much more extensive written accounts of each than in most bestiaries. The accounts unfold as essays, rather than simple, concise descriptions. Solnit, Rebecca, and Mona Caron. 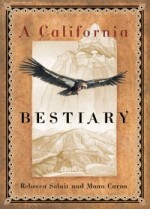 A California Bestiary. Heyday Books, 2010. In this tiny book, Solnit briefly describes and Caron colorfully depicts a dozen animals whose habitat includes California: California Condor, Mission Blue Butterfly, Tule Elk, and others.